Thus far in our homeschooling journey, I have bought a complete curriculum from a well known source of homeschool education, joined a co-op, used an ecclectic approach to homeschooling, thought about dropping out of the co-op, switched math curricula mid-way through the year and the list kind of goes on and on of the trials and errors that I have personally experienced in our homeschool of the past year and a half. While I am no expert at this point, I have learned something that has been EXTREMELY valuable to me and hopefully other "newbie" homeschooling moms out there will gain insight as I share it. Our children are 7 and 4 years old (pre-k and 1st grade). They are what is considered early or lower elementary aged children. In this last year of schooling, as co-op began to seem as if it was stealing time from my teaching duties rather than helping it, my biggest question became "what is truly important for them at this stage?" While my children (the oldest especially), LOVES a good science experiment or history project, the fact of the matter is, the only subjects that are important at this age and stage are Reading, wRiting and aRithmetic, the good old fashioned three R's. Now, I do cover science and history. In fact, we take both those classes at our co-op but I am not spending the majority of our time on those subjects. Number one, they will not remember all of the facts and information that I share on those subjects and number two, if they get reading down as soon as their little minds will allow them, history will be that much easier; and if they get simple arithmetic down, science will be that much more enjoyable. Lastly, because I want to make sure that they are indeed reading, writing and adding and subtracting properly, I don't want to clog up their little brains with a lot of other "stuff". 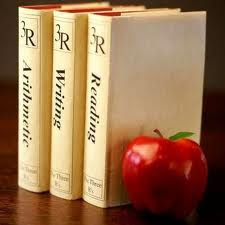 Reading is the building block to all subjects of education. It also gives the child a strong sense of independence and confidence. If they can go into their room and choose a book off the shelf, sit on their beds and not need any help cracking it open and enjoying a little story all by themselves, their confidence in their learning ability just soared as high as the heavens! In the long run, it will also free the teacher (you) up to either focus in with another child or to take a 10 minute breather on those hard days. I can't express enough how taking the pressure off of myself and the kids to cover 4-6 subjects a day to covering the foundation of the basic skills of education has revolutionized our homeschooling experience. And you know what, we cannot measure what "does not" happen as a result of our decisions as much as what "does" happen; with that thought in mind, I can honestly say by focusing on the three R's, our girls have been able to retain the information of these three major subject areas of education, most likely, far better than they would have if we were still aboard the bullet train of 4-6 subjects everyday. Now history and science are treated more like an introductory course (if you will) than a "we have to get everything done by 2 o' clock or else" kind of thing. ::smile:: They are more "fun" than formal. Which is partly why we created Silly School Songs! We needed to add some fun, some music and some movement to our day! So if you too, are homeschooling early elementary children and you find yourself a bit overwhelmed thinking you have to cover every subject with the same intensity and focus...YOU DON"T. Take the pressure off! Just make sure your children are sound and solid in the three R's at this stage: Reading, wRiting and aRithmetic...and you will be glad you did. *To prove the point regarding science, after creating The Water Cycle song and singing and dancing to it a few times during our day, our girls picked up on and could explain the Water Cycle without any problems at all. At this point, we cannot pass a foggy mirror or a bottle of water that's been sitting for a while, without the kids telling us that the water vapors are condensing (they say condensating, but we will straighten that out later). :) But I believe the point is well made that there is no need to spend hours a week on subjects that are important, but not necessary for building basic skills. Steph, this is all so true. Glad to see you, like many of us, have taken an approach that more fits your family. Well said! It can be tempting to force feed learning, it is so much easier:) But following the child makes for an exciting homeschool journey. Thank you for sharing your insights. Thank you for stopping by and for the encouragement! Coming from you...that means a lot! You know how I feel about your school. :) Have a blessed week.